PC gaming’s E3 is finally here. No, not that other PC gaming show that’s taking place next week at E3 proper. I’m talking about Computex 2018, Taiwan’s yearly tech bonanza where the weird and wonderful of PC gaming hardware is shown off to the world for the first time. Sometimes these bits of hardware actually see the light of day. Sometimes they don’t. I suspect Asus’ new entry-level TUF peripherals, however, will fall into the former camp. Let’s see what’s in store. You may have heard of Asus’ TUF brand from their collection of motherboards. Now, however, TUF is expanding to include mice, keyboards, headsets, desktops, laptops and PC cases, all at a more affordable price than Asus’ high-end ROG hardware. This will no doubt come as welcome news to anyone who’s balked at Asus’ hardware prices in the past (*cough* the Asus ROG Claymore *cough* the Asus ROG Gladius II *cough*), but you’ll still have to put up with a little bit of Asus’ angular, futuristic design aesthetic for your trouble. Still, if it means I can save myself a few pennies in the process, I’m all for it. 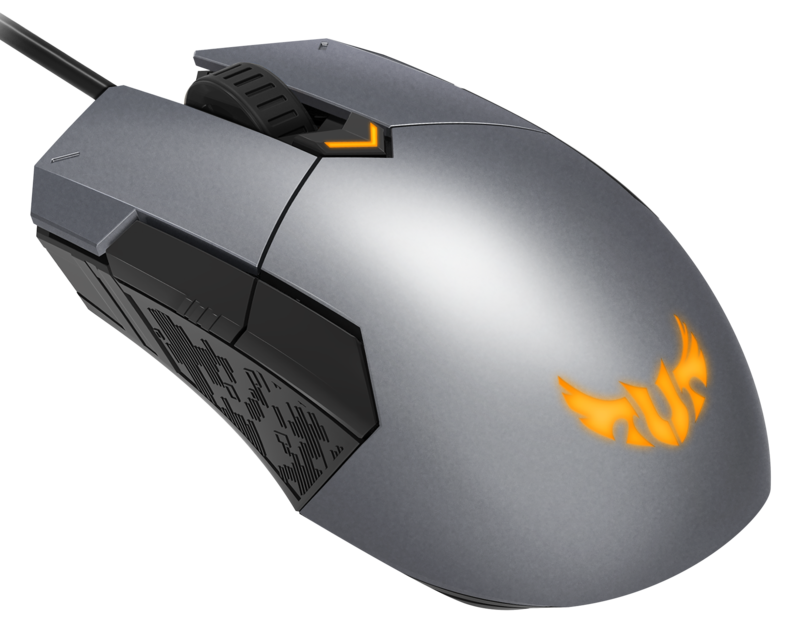 Starting with the TUF Gaming M5 mouse, this comes with a pair of Omron switches guaranteed for 50 million clicks and a Pixart PAW3327 optical sensor, plus a maximum DPI of 6200 and a durable coat of paint that will help it stand up to heavy use, according to Asus. There is also, of course, a dash of RGB lighting that’s compatible with Asus’ Aura Sync tech, and a sprinkle of programmable buttons that can be customised across three different profiles through Asus’ Armory II software. 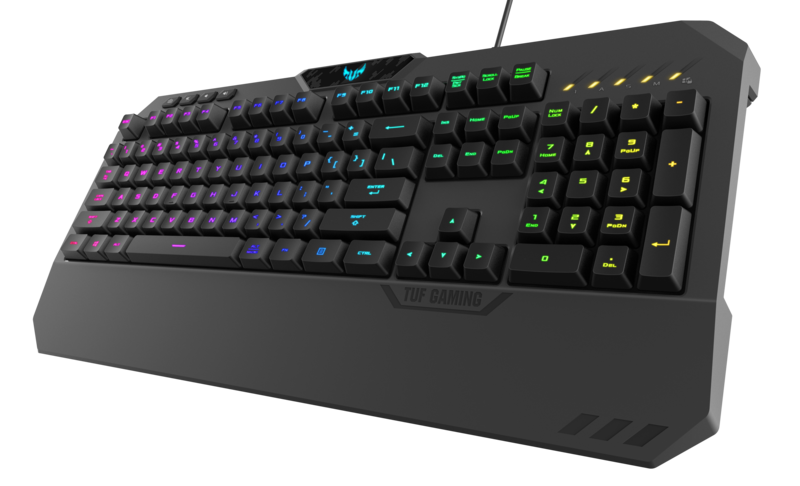 The TUF Gaming K5 keyboard, meanwhile, takes a leaf out of Corsair’s K68 RGB‘s book and comes with splash-proof protection up to 60ml. Asus don’t specify whether that’s 60ml of water, fizzy pop, a fine white wine or another popular beverage of choice, but it should hopefully provide a bit more durability over the course of its lifetime. It is, however, more of a ‘membranical’ keyboard more akin to Roccat’s Horde Aimo than a traditional mechanical one. Indeed, underneath each key cap you’ll find Mech-Brane switches instead of Cherry ones that use a ‘specially-tuned membrane to mimic the feel of a mechanical design,’ according to Asus. I’ll have to wait and see how that works in practice, of course, but if it’s anything like the surprisingly good Horde Aimo, it could be another fine alternative to the CLACKY CLACK keys of Asus’ ROG Strix Flare and other mechanical rivals. 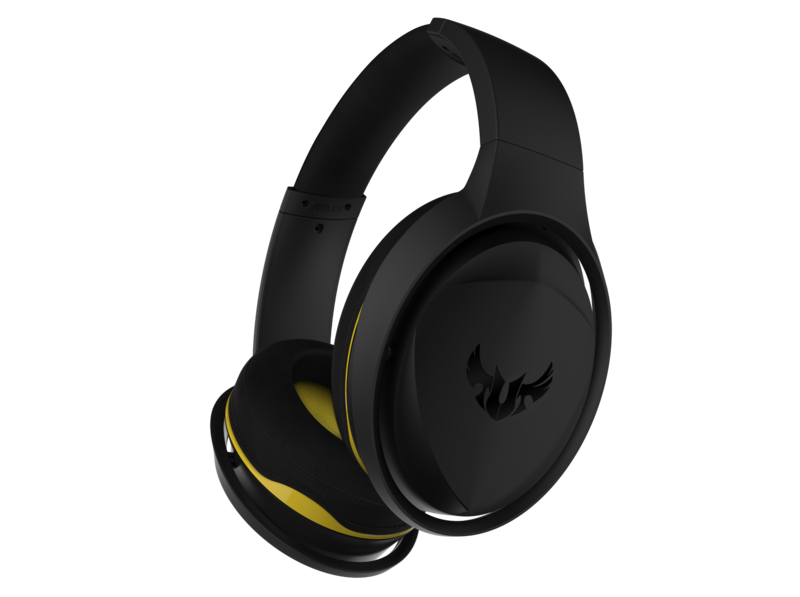 The TUF Gaming H5 headset (do you sense a theme with these naming conventions? ), on the other hand, sounds (sorry) a bit more upmarket. With a stainless steel headband, 50mm audio drivers, USB connection, virtual surround sound and a removable boom mic, the H5 actually looks far more appealing than Asus’ own ROG Strix Fusion headset I reviewed earlier this year, but I’ll have to wait until a bit nearer launch before I can pass judgment on its sound quality and whether it’s good enough to break into our best gaming headset rankings. To complete the new TUF range, Asus have also announced the TUF Gaming GT501 gaming chassis. Most of it is made from steel, but you’ll still find the odd bit of plastic surrounding the front-panel connectors and the base round the front. 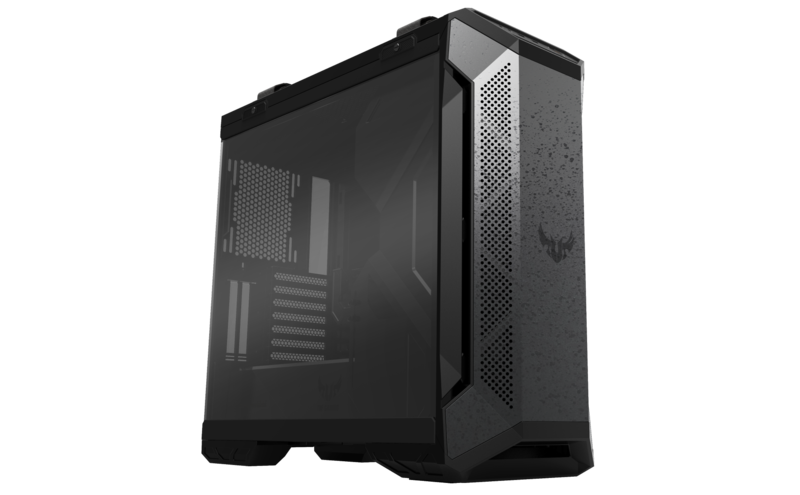 Still, with a sheet of tinted tempered glass on the side giving you full view of all your no-doubt Aura Synced RGB components, it still sounds very much like a premium kind of PC case. Indeed, Asus have even included, and I quote, ‘woven cotton handles’ to give your dainty esports fingers a comfy transportation method for when you’re transporting your PC to all those mad LAN parties you like to attend. Naturally, there’s plenty of space to build inside the GT501, as you get a 30mm gap behind the motherboard tray for easy cable routing, as well as a trio of 140mm PWM fans pre-installed with space for three more to be mounted at the top and three on the front, or indeed dual-fan radiators up to 280mm and triple-fan units up to 360mm. You also get removable dust filters in the bottom, top and front, and space for those all-important RGB lighting strips. Last, but not least, we have the TUF Gaming FX504 gaming laptop and the TUF Gaming FX10CP desktop. The former is a 15.6in laptop that comes with a 120Hz (presumably 1920×1080 – no mention is made of the specific resolution) display and an Nvidia GeForce GTX 1060 chip for silky-smooth gaming, as well as a six-core Intel Core i7-8750H processor. The desktop, meanwhile, will be available in configurations up to a six-core Intel Core i7-8700 processor, and an Nvidia GeForce GTX 1050 graphics card, suggesting this is much more of an entry-level, 1080p-based system than anything else. There’s no word yet on exact pricing, but Asus say everything will be available over the coming months, hitting sometime between July and September. Tagged with Asus, Computex, desktops, Hardware, Headsets, Keyboards, laptop, laptops, mice, mouse, mouse and keyboard.